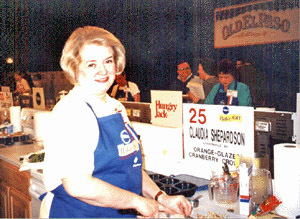 Oct. 18, 2000, marked Claudia Shepardson’s one-year anniversary of entering cooking contests. On that day a year ago, she entered one recipe online to the Pillsbury Bake-Off (on the day of the deadline.) She was selected as a finalist and flew out to San Francisco for the Bakeoff and “one of the most exciting events of my life.” Little surprise then that Claudia became hooked on cooking contests, and with great enthusiasm she began entering a lot of them. But by summertime, dozens of entries yielded nothing but a $10.00 lobster certificate, an apron, a tee shirt, and a baking pan. “I was about ready to give up, thinking I was destined to be a one-shot wonder,” she said. But, with encouragement from her husband, Claudia decided to stick it out for a whole year. Over the course of the next few months, Claudia won the Grand Prize in the USA Rice Council’s contest, then spent the fall traveling to Lynchburg, Tenn., as a Jack Daniels winner and Napa Valley, Calif., as a Sutter Home finalist. Needless to say, Claudia has decided to give contesting another year. NOTABLE WINS: Finalist, 2000 Pillsbury Bakeoff; Grand Prize winner, 2000 USA Rice Council “Rice to the Rescue” contest; Grand Prize winner, 2000 Jack Daniels “The Secret is in the Sauce” contest; Finalist, 2000 Sutter Home “Build a Better Burger” contest; Grand Prize, 2000 Knorr¹s Sauces “Make Summer Delicious” Contest; First Prize winner, Rice-a-roni Chicken and Rice Contest.